Although Auguste Comte is conventionally acknowledged as one of the founders of sociology and as a key representative of positivism, few new editions of his writings have been published in the English language in this century. He has become virtually dissociated from the history of modern positivism and the most recent debates about it. 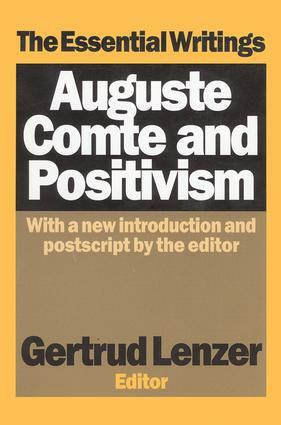 Gertrud Lenzer maintains that the work of Comte is, for better or for worse, essential to an understanding of the modern period of positivism. This collection provides new access to the work of Comte and gives practitioners of various disciplines the possibility of reassessing concepts that were first introduced in Comte's writings. Today much of the ordinary business of academic disciplines is conducted under the assumption that the realm of science is essentially separate from the realms of politics and science. A close reading of Comte will reveal how deeply such current ideas and theories were originally embedded in a particular political context. One of his central methodological principles was that the theory of society had to be removed from the arena of political practice precisely in order to control that practice by means of these same sciences. It is in Comte's work that the reader will be able to observe how the forces of social and political reaction began to be powerfully organized to combat the critical forces in its own and later eras. Auguste Comte and Positivism will be of importance to the work of philosophers, sociologists, political theorists, and historians.